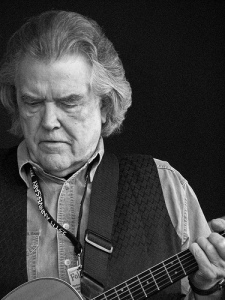 Thinking and rethinking the contributions of Guy Clark. “If I could just get off of that LA freeway…” His spirit lives on in a beautiful way. So glad I saw him perform that night five years ago. Here’s a recipe for banana pancakes that sure to please. No sugar added. In a large bowl, mix together the flour, baking powder and salt. Separately, mix the milk, egg, and butter. Pour that into the dry ingredients in the bowl. Mash the ripe banana flat, and then stir that into the batter in the bowl. The batter will be slightly lumpy. Heat a griddle (a good Teflon coated griddle shouldn’t need oil at all) to 400 degrees. When hot, pour in about a ¼ cup of the mixture for each pancake. Wait for bubbles to show up thoroughly, then turn. Allow to brown on the bottom side (about 30 or 40 seconds) and they’re ready. 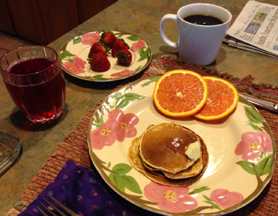 Serve with butter, syrup and a side of strawberries and orange slices. I’ve been making these for years. Never added sugar. And it has minimum amounts of baking powder and salt. 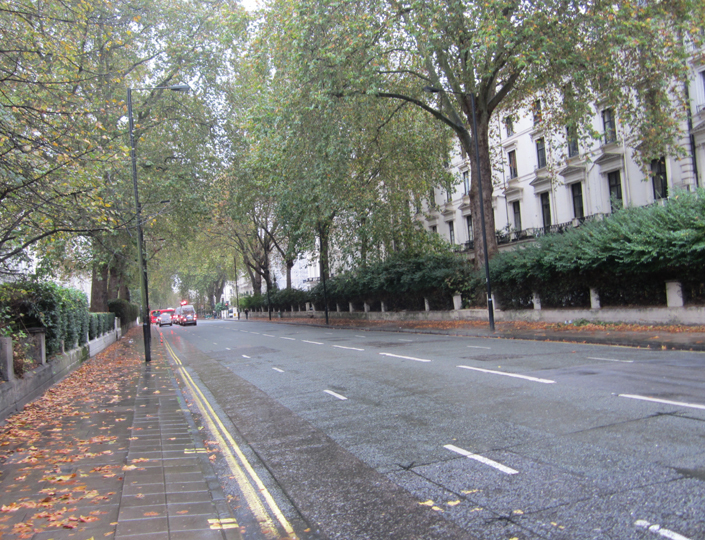 London, England – Let’s say you’re lost. Let’s say you’re in a foreign country. Add in some rain. Throw in jet lag. Forget the map you’ve already checked. Do something most guys don’t do: ask directions. At least here they speak English, right? But it’s me with the funny accent. “Oh, God,” one of the two men said as I asked if I could ask a question. “Don’t turn,” I repeated, but they both had already crossed the intersection – without looking back at me, the poor lost soul on the rainy streets of Westminster. 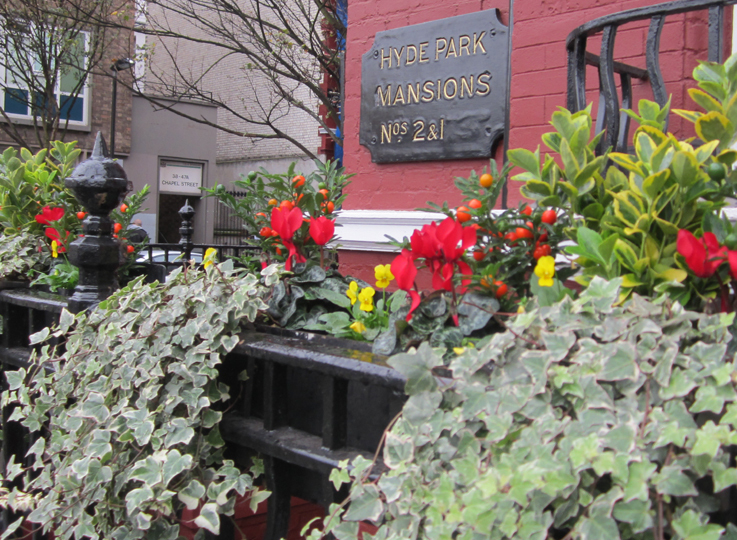 Hyde Park Mansions, Cravens Road, Bishops Bridge, Sussex Gardens – the names swirled in my head as I looked again at the map. I’d unknowingly gone exactly the wrong way as I left the hotel in search of Oxford Street. I’d already made a trial run that morning down Edgware Road and was within two blocks of Oxford and all its shops, but it began sprinkling and I realized my umbrella was back in the hotel room. I turned back and vowed to take a different, more interesting route on my second attempt. Bad idea – the one about taking the alternate route. Good idea – the one about the umbrella. But after almost an hour of trying to find Oxford and looking at Bishops Bridge rising into the air, where the hell was I? “The best way is to take the tube, it’s right down there,” and he pointed to an entry way to the London Underground a half block away. I followed him and we both ducked into the entrance and out of the rain. I bought a ticket, asking for the Edgware Road station, instantly giving up on the whole Oxford Street idea. Within seconds I was gone – at least away from Lancaster Gate, which is where I was but didn’t know it. I asked the young girl sitting next to me for help. She got out her own map of the Tube and told me to get out at the next station and take the Central Line. “Queensway,” the conductor said over the PA system. Suddenly I was out of the car again as the young girl gave an open palm, side-to-side wave as if to say, “Whatever.” She was very helpful though. In fact, she had saved me. I followed the signs to the Central Lines, green and yellow life lines that would take me back to where I began this crazy journey. 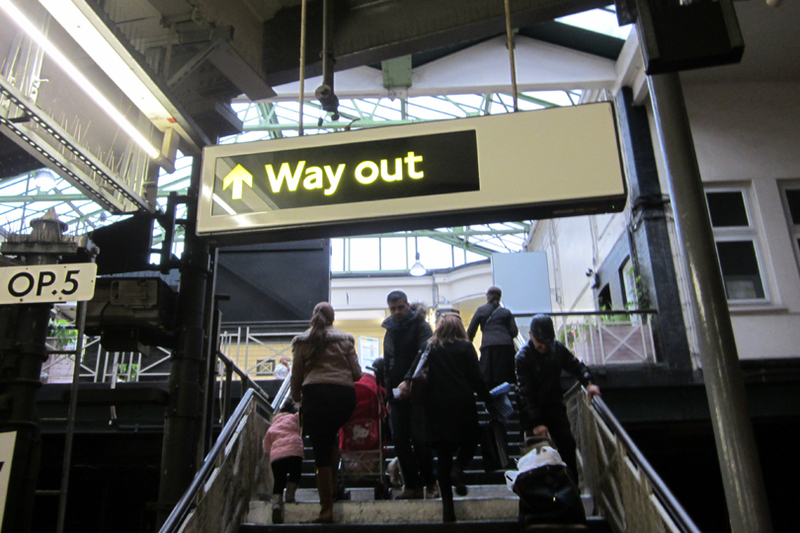 The recording came on as I boarded, “This line is a circle line to Edgware Road,” the announcement declared with that distinctive British clip as I sat down and watched the Queensway tube sign disappear along the age-old brick walls outside the train windows. “The next stop is Edgware Road,” I heard. I stepped out. There was the sign I’d been looking for so long: Way Out. Yes, the Way Out. I slipped my tube ticket in the exit turnstile and the gates opened. I exited. Not bad. I emerged at street level and saw the hotel marquee within one block. It was pouring rain. But I had my umbrella and I was home. Safe. When I next go to Oxford Street, I’ll walk. “Bang the drum slowly” comes to mind, given the old trumpet player always liked a good downbeat. Throw in some laughter, because that was surely there—most days I’m sure. He had that kind of “life is ridiculous” take on most things, even though he understood probably everything through a mathematical steel trap that said emotion has no place. That’s where all that smooth jazz came in, the notes floating here, there, and everywhere (one of his favorite Beatles songs). Strange: a couple of friends revealed around Christmas just past that they listened to Firesign Theatre back in the day. How many times did we spin those LPs? I repeated lines verbatim to my two friends, who had no way of keeping up. 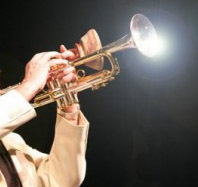 And then I learned the old trumpet player passed away on Christmas Eve. “All out for Fort Stinking Desert.” There’s that laughter again. Laughter carried the day for him. He could laugh at math problems. He could laugh at physics. A beautiful woman passing by? A certain smile, I’m sure. Oh to be inside that mind of his, but no—no chance. One could get close. He was okay with close. He was okay with silence. He was okay with me and you and everybody else. I last spent time with him in Portland, Oregon, his new-found hometown. It’s been almost twenty years. He picked me up at the Portland Airport. Ate at Jake’s downtown. Great West Coast seafood. He seemed content in Oregon. I enjoyed being around him, talking, catching up about the years that had zipped by. Laughter, there it goes again. When I learned that he was gone, flying high in some super nova somewhere, I went to a bar on Earth and drank some Shiner beer. In his honor. To his memory. The old trumpet player and I were once tripping through the Hill Country, down by the Blanco, throwing horse shoes at a post. Debating, and laughing. So cool, so cool. The old trumpet player, my friend. Now gone. Keep flying, you super nova, wherever you are. A job is a job. But one of the all-time dream jobs is lifeguard. You’re cool at the pool, it’s always sunny, and the tan…well, you get the idea. When my old friend Boston Bob sent me a Facebook message about a Barton Springs lifeguard reunion, the dream job image shot through my mind. Bob, a true New Englander, left Austin after his lifeguard stint in the early ’80s. We had played on the same softball team back then. I hadn’t seen him since, but Facebook reconnected us. He resides in Atlanta, but he’s still a Red Sox fan. No surprise there. The problem for me with the reunion: I was never a lifeguard. Maybe I should’ve been. 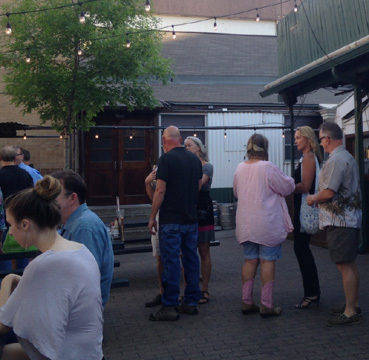 I certainly wanted to sit up on that tall white platform above Austin’s favorite watering hole. And since the lifeguard reunion would include the fine folks who actually did sit way up high from 1976-82, I might recognize some faces besides Bob’s. 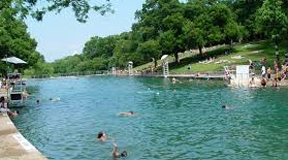 I was at Barton Springs all the time, swimming, snorkeling, checking out the scene. It was the place to be. So on a sunny afternoon in early May, I showed up at Scholz Garten, another Austin treasure, to meet up with Bob and his fellow lifeguards. I got to Scholz’s just as the Kentucky Derby was announcing post-time. Bob wasn’t there yet, so I sipped a Real Ale Fireman’s Four and watched as the greatest two minutes in sports flew by on the big screen just above the bar. The race was over and still no Bob, so I wandered out to the beer garden area. I sat at a table across from a guy who was there because his brother had been the pool manager back in the day. So here the two of us sat, neither of us lifeguards. From our vantage point at a worn out picnic table in an old Austin icon, we watched the joy of a reunion: hugging, laughing, and people maybe not recognizing each other. I didn’t know a soul. One or two faces seemed familiar. Even lifeguards get old. Bob did show up. As we talked, I realized the tough road he’d had. He was sober for one thing, and had been for nine years. I was glad for him. He was divorced for another, but remarried. And he had a twenty-something son he was very proud of. Showed me pictures on his smart phone. I was happy for him. About the divorce, he joked, “I didn’t get along with my wife’s boyfriend.” He grinned, and I saw the same confident look in his eyes from back in the old days when he was sitting up on the lifeguard stand. As darkness descended and the twinkle lights in the trees came on to provide some outdoor lighting, a lifeguard (well, a retired lifeguard) with her smart phone camera asked everyone at our table for a group photo. I stood and moved to the side, but she insisted I get in the photo. Click! We all laughed and for one evening, I was a Barton Springs lifeguard. What a cool job. 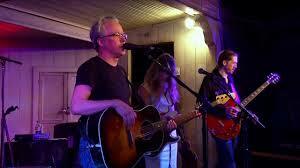 I thought about bringing pen and paper to the Radney Foster gig at Gruene Hall last summer. 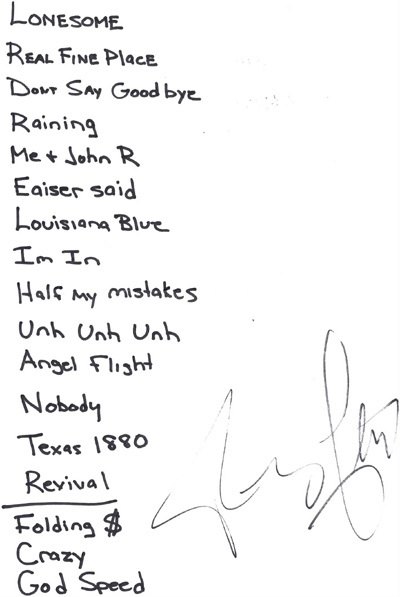 It would be nice to look back on the list and remember which songs this super songwriter chose to play in the set. Nah, forget that. Too much trouble. Then a delay in getting out of the nearby restaurant put us in a line for the show stretching down the sidewalk. We’ll probably be near the back of the hall, I thought. Too crowded. The rustic venue is small and seeing acts like Raul Malo and Guy Clark is especially enjoyable if you’re sitting near the stage. Gradually the line moved forward, it was getting dark outside and as we hurried toward the side entrance, our hopes were up that we’d at least get seats maybe halfway back. Surprise! No chairs were set up at all. And only a few people were hanging around at the front near the empty stage. We headed that way and were greeted by five or six women, apparently all friends with one another. Before long, they passed a bucket of longnecks our way and offered us free beers. Radney Foster, dressed in jeans, boots and a black t-shirt, came onto the stage with the band. They all took up their instruments, the keyboardist settled in near where we stood just a few feet from the stage, and Radney leaned into the microphone. “I’m Radney Foster from Del Rio, Texas.” Whoops and hollers filled the air. All the female friends pushed up closer, as we did. He looked down at us and smiled. The band started into the first song. Radney sang, “Just call me lonesome, heart broke and then some…” The night had begun. The female bass player grinned at the crowd’s reaction, the tall longhaired lead guitarist concentrated on his fret and fingers, and we were rocking. The women friends passed more beer our way, and everyone was happy. Radney laughed when he looked down at the women. He glanced at us (mostly Cherie) from time to time. Everyone was having a good time. The set list was at his feet. I could see it from where I stood. As Radney sang his last song, “God Speed,” alone on stage, I wished I had brought the pen and paper to track the songs. 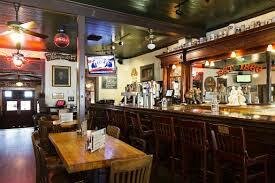 He concluded to wild applause and said he’d be back by the bar to meet anyone who wanted to stick around. He tossed a pick into the air and reached down for the set list. I extended my hand and he looked up and smiled. He handed it to me and walked off stage. We went back to the bar area. Folks were standing patiently in line to get pictures made with him. Cherie had her photo taken. “Now what was your name?” he asked her, obviously remembering her from the crowd. Flash…the camera took the picture. I stepped up and shook hands with him. “Would you sign the set list?” He grinned and took pen in hand. What a night! So we’ve skipped spring this year. Big deal. It’s hot – already in the 90s in April. Is that what’s got you down? Fear no more. Here’s the recipe you’ve been waiting for: the Three Olives® Cherry Vodka Limeade. Be sure you get the Three Olives® Cherry Vodka for this too. Experts have advised me, so I’m just passing that along. In fact, there’s some really awful flavored-vodkas out there, so don’t mess around with this key ingredient.